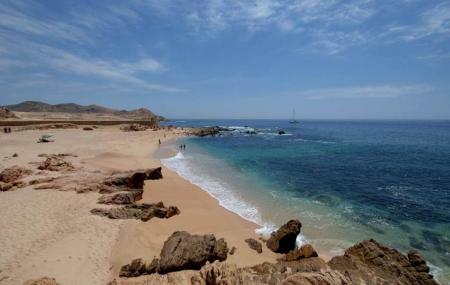 The Twin Dolphin is perhaps the most romantic beach you will come across in Cabo. The jagged coastline is full of volcanic rocks and lots of nooks and crannies that play peek-a-boo with the endless horizon. This beach is now called Widow’s beach and it’s rich reef makes it great for snorkeling. On a full moon night, this beach is the epitome of romance as the moonlight dances off the excited waves of the ocean. Even though swimming here is not recommended, the beach is highly popular as spot for sunbathing and picnics. Beach access is marked and remains open, but watch out for heavy construction equipment along the access road as there is development work in progress at the time of writing. Don't expect any service here as there are no rentals, or food/beverages sellers. If you want to spend a quiet time bring your own umbrella, towels, refreshments. Take a taxi or walk here. How popular is Twin Dolphin Beach? People normally club together Vitrofusion Glass Blowing Factory and Arte De Origen while planning their visit to Twin Dolphin Beach. People also prefer to start their day with Twin Dolphin Beach.